The 69th Berlin International Film Festival kicked off today(February 7th) with the opening ceremony, and 'The Kindness of Strangers' premiere at the Berlinale Palace in Berlin, Germany. 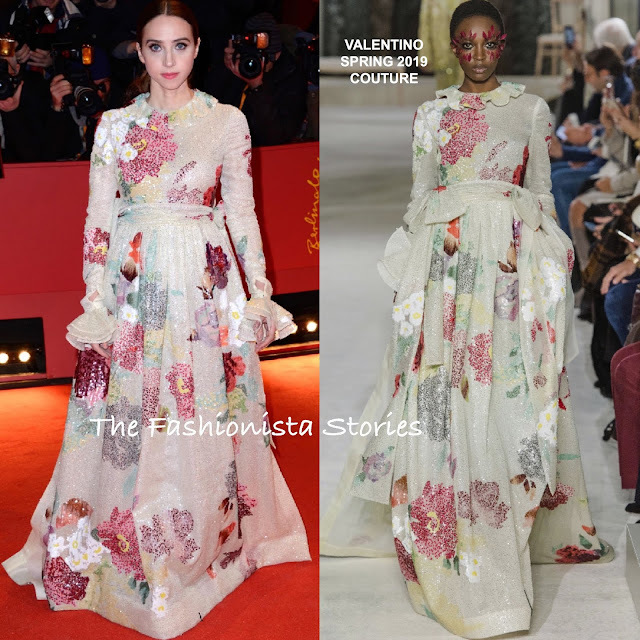 Zoe Kazan gave the VALENTINO SPRING 2019 COUTURE it's first red carpet run. She wore an ivory ruffle floral sequin gown, which was accessorized with REPOSSI jewelry. To compliment her detailed gown, she wore her hair in a center part ponytail which topped off her look along with a colored lip. Juliette Binoche who also attended the Global de Cristal event, wore a GIORGIO ARMANI PRIVE FALL 2018 black velvet gown, with an bow waist. Her gown was layered with a long sleeve gold semi-sheer top. If this looks familiar, that's because Elizabeth Debicki wore the runway version in September 2018. A complimentary beauty look and CHOPARD jewelry rounded out her look. Andrea Riseborough ditched wearing a gown for a TOM FORD FALL 2018 black velvet mini dress, featuring a sheer panel yoke and contrasting embellished collar, and cuffs. Andrea arrived wearing the black & white printed, kitten heel slingbacks from the runway but she ditched them for black pumps. However I wish she kept them on and left out the long the earrings. Toni Garrn wore an ALEX PERRY RESORT 2019 black crepe gown, which featured a pleated satin bodice, and dramatic split cape sleeves. Adding some sparkles to her look, she accessorized with BULGARI jewelry. Andie MacDowell looked lovely wearing a ALBERTA FERRETTI LIMITED EDITION SPRING 2019 duchesse satin gown, featuring a low-back, with cascading ruffles and sinuous collar and train. Although her gown looks black, it is actually navy. A complimentary beauty look and matching clutch rounded out her look.